Chronic alcohol exposure—whether from fetal exposure during development or binge drinking during adolescence and adulthood—impairs brain development and function. Research suggests that the brain's resident immune cells (called microglia) play an important role in this harmful process, as they regulate neuronal networks during critical periods of brain development and protect the brain against injury and disease. Additionally, research shows that chronic alcohol exposure damages the barrier cells that line the organs of the digestive system. As understanding of the microbiome and its importance to overall health has advanced over recent years, researchers from the Department of Inflammation and Immunity and the Department of Neurosciences wonder if gut-brain interactions may influence microglia's role in alcohol-related neurotoxicity. Laura Nagy, PhD, who studies alcohol's effects on the intestines and innate immune signaling, and Dimitrios Davalos, PhD, who has expertise in neuroinflammation and neurodegeneration, lead the cross-department collaboration. The team will investigate using preclinical models and imaging technologies developed in Dr. Davalos' lab how increasing alcohol exposure affects the interactions between microglia and neurons (nerve cells found in the brain), and leads to neuronal dysfunction. They will go on to investigate whether preventing alcohol-induced loss of gut integrity using a therapeutic agent previously developed in Dr. Nagy's lab (hyaluronic acid, also called HA35) can curb microglial activation and subsequent neuroinflammation. They will validate their findings with brain tissue collected from patients with a history of alcohol-related pathologies and stored at Cleveland Clinic. If the team finds that HA35 does in fact protect the gut and prevents alcohol-related neuroinflammation, there is great hope for rapid translation into clinical trials as HA35 is currently undergoing safety testing in healthy adults. More than half of all patients diagnosed with Crohn's disease (CD)—a chronic disease that causes inflammation and irritation in the digestive tract—present with intestinal strictures, or obstructed intestines. Most scientists have long assumed that immune cells are the central players in this process. Researchers from the Department of Inflammation and Immunity and the Department of Molecular Cardiology think there is another hypothesis worth investigating. 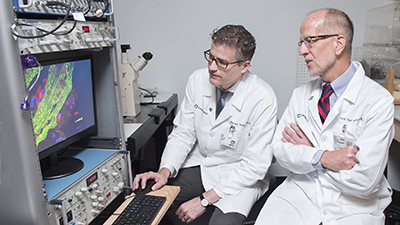 Florian Rieder, MD, a physician-scientist who specializes in researching and treating patients with inflammatory bowel disease, CD, and ulcerative colitis, and David Van Wagoner, PhD, an expert in atrial fibrillation (AF) research, have teamed up to uncover how fat cells may contribute to CD-related fibrosis and intestinal narrowing. In CD, the affected sections of the intestines are commonly wrapped in fat—a pathology referred to as "creeping fat. 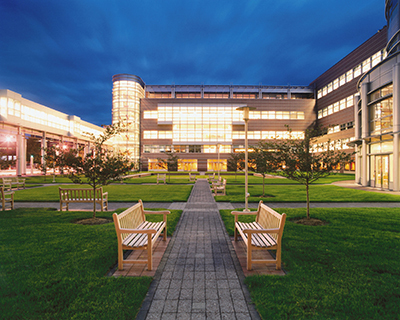 " Interestingly, patients with AF present with creeping fat around the atrium. Since CD and AF are the only diseases in which creeping fat is well characterized, and fibrogenesis is a key characteristic of both, Drs. 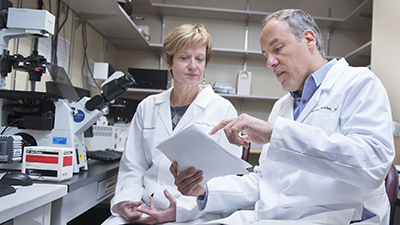 Rieder and Van Wagoner are teaming up to uncover the mechanisms that may connect creeping fat in CD with intestinal stricture formation. The research team suspects that creeping fat contributes to the abnormal intestinal narrowing characteristic of CD by inducing smooth muscle cell hyperplasia (increased tissue mass due to cell proliferation). They hypothesize that alterations in free fatty acid metabolism drive this process. The team will conduct a series of cell signaling and proteomic analyses in human tissues and cells to evaluate the direct and indirect interactions between fat cells and intestinal muscle cells. With a better understanding of how creeping fat contributes to intestinal obstruction, Drs. Rieder and Van Wagoner hope to identify viable therapeutic targets to prevent or treat intestinal stricture formation. This discovery would have great impact as surgery, which is costly and timely, is currently the only option for patients. The proposed studies may also improve understanding of the mechanisms and advance the treatment of AF, the most common cardiac arrhythmia and an important cause of stroke. The Co-Laboratories Award is important not just because it forges new and otherwise unlikely collaborations between people across Lerner Research Institute, but also because it makes early stage research possible. This seed funding will provide the data these researchers need to secure larger funds from external sources, like foundations and the National Institutes of Health. The Co-Laboratories Award is helping Lerner researchers get new and cutting-edge ideas off the ground. This potential for discovery and lasting and productive cross-department collaborations is critically important.